Students - Yesterday I was pulling into the library to return a few books, and I saw this little cardinal whirligig spinning its wings around so fantastically that I had to stop the car, get out, get close, and really look. He is in someone's yard, right so close to the fence, and it was a treat to take a moment out of my day to just enjoy watching him spin. We've been having some very windy days 'round these parts, and I would not be surprised if he just took off one day! Our family actually has two whirligigs in our yard - one cardinal and one yellow flower. I will take a picture of them to share with you. I am sure that they were spinning like mad today too. I first heard the word 'whirligig' in Cynthia Rylant's MISSING MAY. Where did you first hear it? Have you ever fallen in looooove with a word? Whirligig! If you would like to learn all about whirligigs, here's a video from The Block O'Wood. For today's Poetry Friday celebration, I am very happy to welcome back Stacey Buck, a speech-language pathologist (and my friend) from Chicago, this time with her poet-student Curly Sue. Thank you, Stacey and Curly Sue! I was so happy to share this poetic and fun back and forth with you. 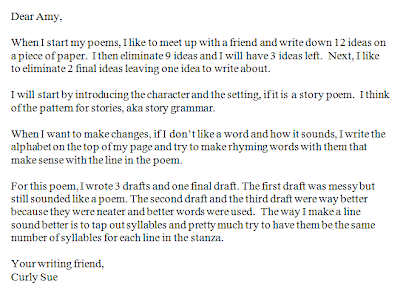 To make writing more fun, we decided to create a writing club. Even though it was only the two of us, snacks, some music, or a mini-field trip outside made it more enjoyable. 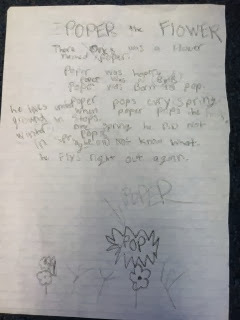 Once we picked a topic (in this case, poetry about nature), I wrote as well in order to model some writing strategies. 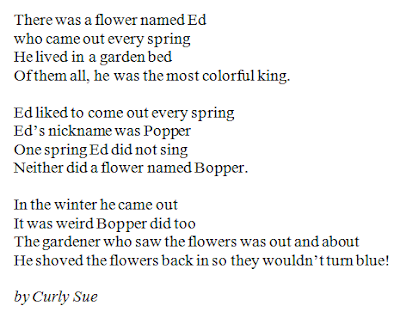 I like story poems in particular because they allow for work on story grammar and sequencing in addition to poetic devices. 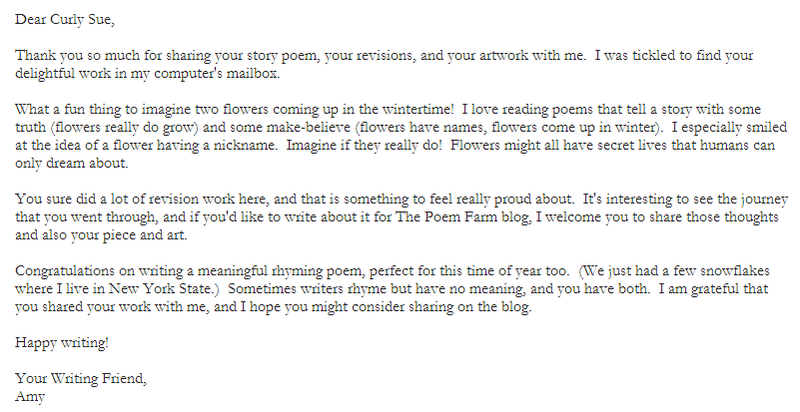 Poetry is also a great way to work on writing since The Poem Farm is so accessible for teachers and students alike. Thank you, Amy. 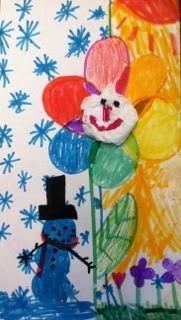 I read the story poem that was written by you about a snowman. 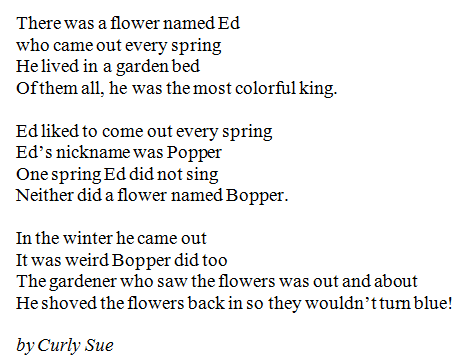 Then I thought of my own story poem about a flower. 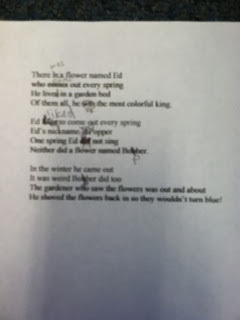 Next we read the caveboy poem so I would have an idea of how to lay out my poem. I did 3 drafts and 1 real version, which I am sending to you. I made a picture to go with the poem so you would get an idea of what the flower looks like. 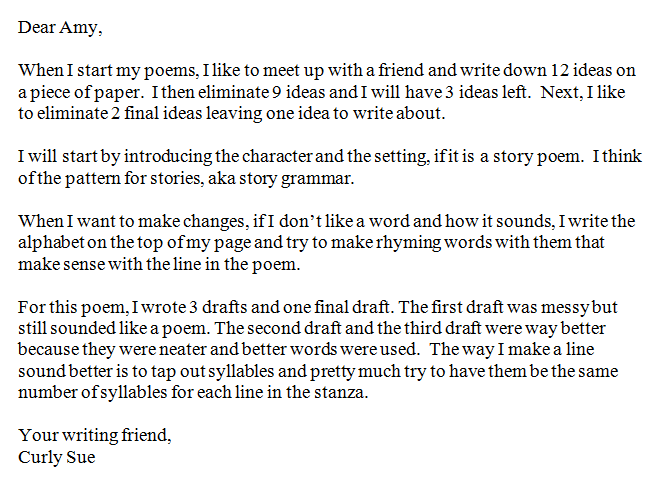 If you write back, I would appreciate it. 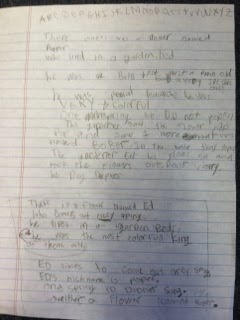 It is a joy to read about a writer's process, regardless of age or topic. I find myself inspired by Curly Sue's dedication and her willingness to share it too. Thank you to these Chicago friends for joining us today. Jama is hosting today's Poetry Friday roundup over at Jama's Alphabet Soup. You will not want to miss her (and her teddy bear's) recommendation of a very soulful and wonderful book. 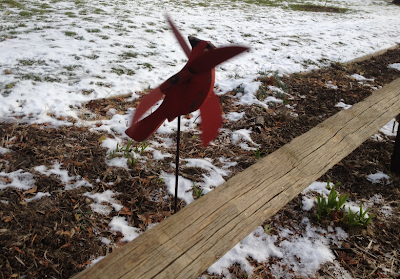 Watch the one second video that I took of today's cardinal whirligig below. 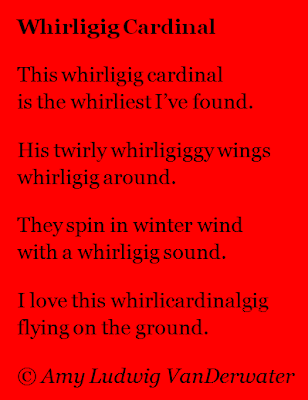 I love the word whirligig and your poem made me say it over and over rolling around on my tongue like the flapping whirligig wings. 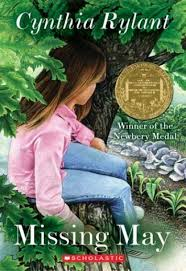 Missing May is a favorite of mine. What joy to inspire a young writer and hear about her process for writing. This was a treat, Amy! It was a treat reading about story poems - thanks to Stacey and Curly Sue! I'm eager to try it in my own classroom. Delightful whirligig poem -- such a great word! Fun reading about Curly Sue's process. Lovely post! It's always fun to see what you're doing with words, Amy, like "whirlicardinalgig". They do catch our eyes, don't they? And I love seeing all the steps of Curly Sue's poem. What a fun idea to think of flowers getting mixed up & arriving in winter! 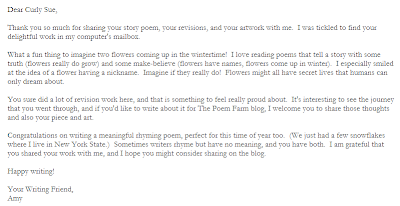 Thanks for inspiring me about story poems! Your whirligig poem is zippy, silly fun! And I love the way Curly Sue has her writing process so well defined--I especially love her brainstorming and narrowing down procedure. I love lists, numbers, statistics, etc. Mixing those with something as non-statistical as poetry is always fun! A fun poem, Amy. A poetic tongue-twister!